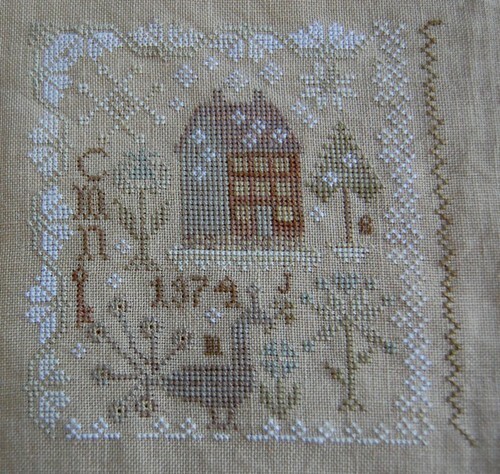 Nicole's Needlework: Snow Garden Finished!! I decided to get out my Anniversaries of the Heart project. Katrina, Siobhan, Laurie, and Faye (I got to see Faye's in person and it's just gorgeous) have inspired me so much, that I really want to get back to it! 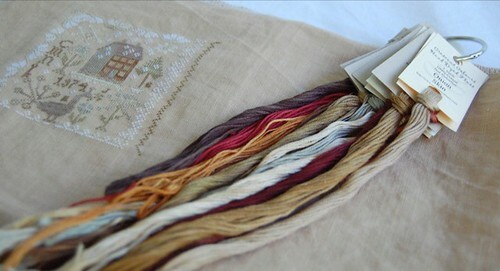 40 ct. Meadow Rue by Lakeside Linen, GAST and WDW. 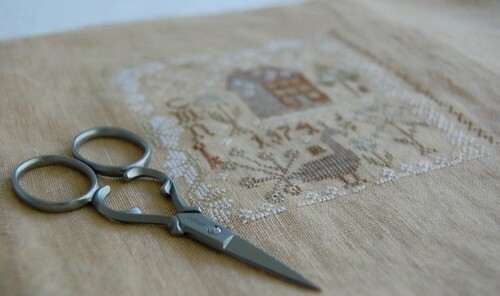 The last picture shows off the beautiful scissors I got for my birthday from a very special friend!! Thanks friend!! :) My husband's birthday is in January, so I put his initials and birth year and then I did our kid's initials over one. I plan to put my great-grandmother's name for February - Olive Emma Roof (isn't that a great name)? She was the most important person in my mom's life, and unfortunately she passed away while my mom was pregnant with me, so I never got to meet her, but from all the stories I've heard of her she seemed to be a very special person. Well, my dad and his wife are coming this weekend, so I'm not sure how much stitching I'll get done. Not sure what we have planned. I think it's going to be a quick visit because they are headed down to Florida for the winter. Write soon!! 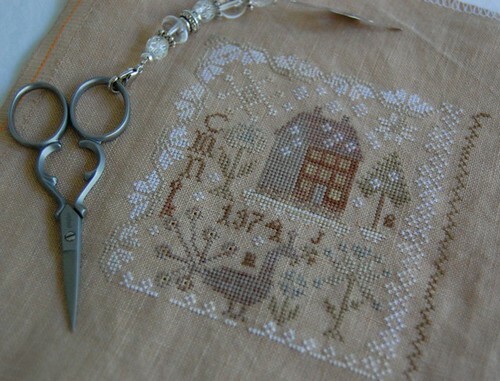 Seems like so long ago when we met at Shelley Gore's house here in Atlanta to stitch. My how life changes! Oh Nicole that is just beautiful! The more I see these design the more I want to stitch them. Especially when I see how everyone is personalizing them. That makes each one so special. Wonderful finish!I like Snow Garden and how great to personalize it for your DH and the boys! Can't wait to see your start on Block 2! What a beautiful finish and a great idea for the initials and date. Can't wait to see more. Snow Garden looks wonderful. I'm glad that you were inspired to work on it. And my grandmother's name was Olive. We used to call her Olive Oyl! Beautiful piece!! I have all the patterns so far, but I haven't decided if I'd like them all on one piece or separate. Oh those snow birds. That's where my FIL and wife are now. Beautiful start on your Anniversaries of the Heart! Wow!!! This block is gorgeous!!!! Can't wait to see more!!!! Nice finish...as usual. Hope you have a nice weekend with you family! Looks great! We never know what you'll show us next that you're working on, it's a lovely surprise each time to look at your blog. So pretty! I need to pick up the threads for all of these so I can start! Love it!!!! You know I think it's just the funnest project ever :-). Have a nice time with your dad! Oh, that's so pretty! Your Grandmother needs to have a sampler of her own, you know - so you can use her name! That is just so beautiful Nicole. I can't wait to start these next year! Very pretty, Nicole! And a very sweet personalization. Congrats on this lovely finish - a beautiful start to this great project!